Most people would agree that eating healthy is important, but it’s hard to make a priority. If you’re like me, you’ve found yourself following a roller coaster of a couple weeks of intensely clean eating followed by a dramatic fall off the bandwagon. Another big challenge is that the definition of “healthy” is different for everyone based on personal lifestyles and what fuels your body best. Whether it’s paleo, gluten-free, grain free, whole foods, or something else, eating healthy takes time, planning, and commitment. I have highlighted some of the main pitfalls that happen when you overhaul your diet and shared some practical solutions to these problems. Learn to embrace simple meals. Don’t go for an elaborate stuffed chicken breast with zucchini noodles. Grill a chicken breast with zucchini on the side. Learn to cook one dish meals. Not only is there less clean up, but these dishes tend to be less involved to cook. Shop at Aldi! 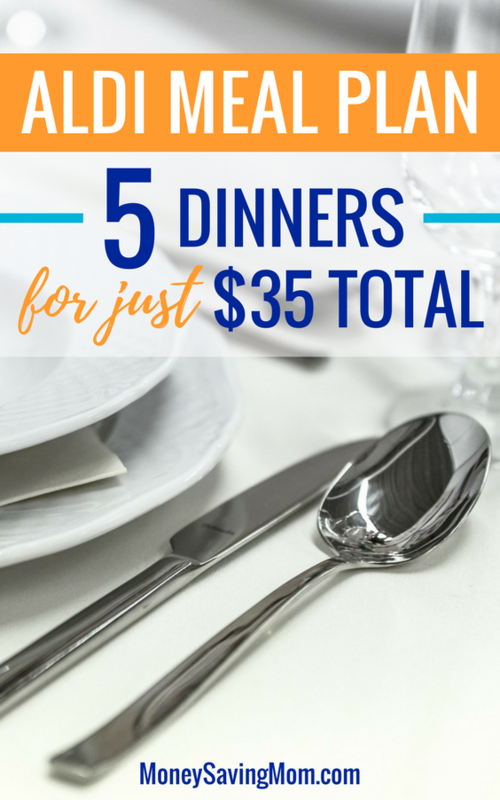 I’ve included 5 dinners for $35.43 total. Repeat family favorites frequently. You don’t need to reinvent the wheel every week. Make healthy freezer meals to pull out of the freezer when you are tempted to order a pizza. Don’t make it all or nothing. If you have something delicious that isn’t part of your healthy eating plan, give yourself grace! Enjoy it and keep moving forward. Personally the 80/20 plan works for me. About 80% of the time I eat very healthy (sugar free, gluten-free, and limited grains). But… if I go out with friends, I’ll totally enjoy a gluten-free cupcake or ice cream! After trying to figure out how to feel my best on diets like paleo, whole foods, and gluten-free, I have learned that it takes time. You have to listen to your body and figure out what gives you energy. There’s no one-size-fits-all plan, and you can’t overhaul everything at once (especially if you have a hectic schedule and little mouths to feed). I have included a meal plan that fed my family of two adults and two small kids as an example of how healthy eating doesn’t have to be expensive or really involved. It covers five delicious meals that cost only $35.43 total at Aldi. You’ll also find some printable recipe cards and an easy to use shopping list! I hope you can use this meal plan as a springboard to create your own ideas and recipes and move your family’s health in the direction you want. Sophie’s path of navigating an autoimmune disease and challenging food allergies have driven her to lead her family of four through incremental change toward greater health. Her blog, , shares practical recipes, meals plans, and resources for moms who value clean eating, real life, and no food-shaming! I love the idea of the one-pan meals. Noticed the shopping list is missing the sausage for the first recipe though. Thank you so much! Whoops 🙂 I’ll fix it and send an updated file. Here’s a link to the updated file! Thanks again for letting me know! I must admit, though, that I get so tired of all of these “eat healthy for less” posts saying to just shop at Aldi. Not all of us have an Aldi nearby, or even grocery stores that carry many organic products. Go to my site 🙂 I have a Walmart plan. Hope that helps you ? Oh thanks for posting I also have no Aldi near me. Absolutely. Walmart has some really great prices too and if you are trying to save I’d focus on cutting out the processed food first before worrying about organic products etc. I’ve lived in quite a few places and have always managed to find a locally-owned, non-chain store produce market. Sometimes there are produce outlets that buy the overstock (a whole trailer of melons) or imperfect (smaller oranges) items and sell them for less. You may have to be flexible with your shopping list and use the items within a week but it is well worth it. I fill my cart for about $20-$25 per week. I buy meat and other items at a grocery store or online & can maintain an 80% paleo diet for the same price as I did before I went paleo. It took a while to adjust my eating, but it was a big help with health issues. Go you!! It sounds like you have a great system for eating healthy! I agree that simple meals are often better. It doesn’t have to be fancy and expensive to be healthy. Thanks for sharing! Oh I feel you! The mess can be exhausting. Haha I do feel like I’ve gotten faster at cleaning the kitchen and that’s when I listen to audio books, so at least I’m multi tasking ? Hi Sophie, thanks for posting these. I also have an autoimmune disorder and realized through doing an elimination diet that I can’t have gluten or dairy. It’s challenging to be on this diet – mostly because of the social aspect! – but I’ve seen a turnaround in many symptoms through dietary changes. Like you said, It’s worth the time and effort to be healthy for myself and for my family. Keep up the good work! I’m SO happy to hear it’s making you feel better! It really is such a blessing to find something that helps that isn’t just medicine. Good luck! P.S. I think the social stuff gets easier with time. Eventually your friends get it and it gets easier and easier to navigate social situation. That said, I totally get it! My husband’s boss once shoved a piece a cake in my face to try and that was hard to gracefully navigate ? We just found out that my daughter has a soy allergy (among other things) so we are overhauling what we eat. I am so thankful for this post. It came at just the right time for me! I will be trying out your recipes this week. Oh man! Soy allergies are SO tough because soy bean oil is in everything! Can she have soy lechtin? Thanks for these great tips, I also like to shop at Aldi here in UK . I like grocery shopping at Aldi because they are less expensive than other supermarkets and you save money. Yay! Glad you enjoy Aldi as well! Isn’t it great??! This was a great plan for helping me get back to meal planning and budgeting post baby. I wasn’t sure it would feed my hungry crew…there was talk of leftovers being used in one of the meals but I didn’t think we would have that. So I grabbed a few extra veggies to use. But the idea helped me get going!